WIN THE BEST BBQ EVER. WORTH OVER $800! UP FOR GRABS IS A KAMADO JOE JUNIOR GRILL, LODGE PIZZA PAN, GRILL GLOVES, AND MORE. ENTER TODAY FOR A CHANCE TO WIN! Log in to add to your wishlist! Discover the perks of cooking with cast iron! 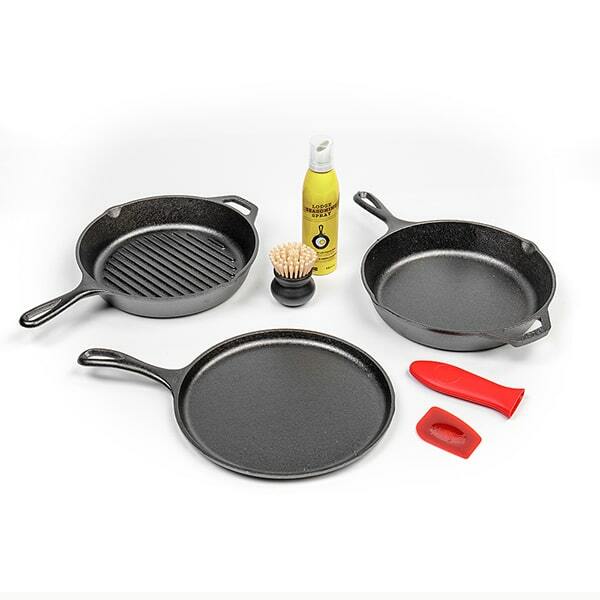 This complete, high-quality set from Lodge® offers you versatile, durable cast iron cookware with everything you need to clean and care for it – pan scraper, seasoning spray, scrub brush, and hot handle holder. It's a great addition to any kitchen. Cookware is made in the USA! » View Our Store Events - There's Something Every Weekend! Have an Idea for a Product? Want a catalog mailed to you? Click here! We stand behind our products and want to make sure you are pleased. Copyright © 1995-2019 Lehman Hardware and Appliances Inc, All Rights Reserved. Designated trademarks are the property of their respective owners.